The second qualifying session of the weekend at the Red Bull Ring marked an up-turn in form for Felix and Mücke Motorsport, as they out-qualified championship leader Esteban Ocon as well as overall runner-up Max Verstappen at the Austrian Grand Prix circuit. Coming off the back of his fourth-place finish in this morning’s Race 1, Felix headed into second qualifying eager to keep up momentum, and duly set about throwing in the laps as the session got underway. After an early red-flag stoppage, brought about when Hector Hurst parked his West-Tec machine with engine problems on the start/finish straight, the fastest laps were all set in the closing stages, with Felix eventually ending up fifth on the outright charts used to determine the Race 2 grid, out-pacing Ocon and Verstappen by the odd tenth of a second. On the list covering second-fastest times, however, which forms the basis for tomorrow’s Race 3 grid, Felix had to make do with eighth after getting stuck in traffic on a lap which would otherwise almost certainly have been enough for another top five effort. 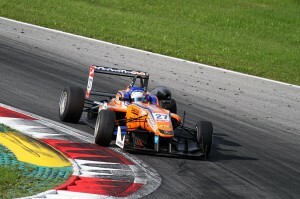 Carlin’s Antonio Giovinazzi swept to a set of double pole positions, ahead of team-mate Tom Blomqvist as the British outfit continued to enjoy a strong weekend. Felix wound up 0.366s shy of Giovinazzi’s outright benchmark, slicing half of the deficit of yesterday (six tenths) to P1 in qualifying.